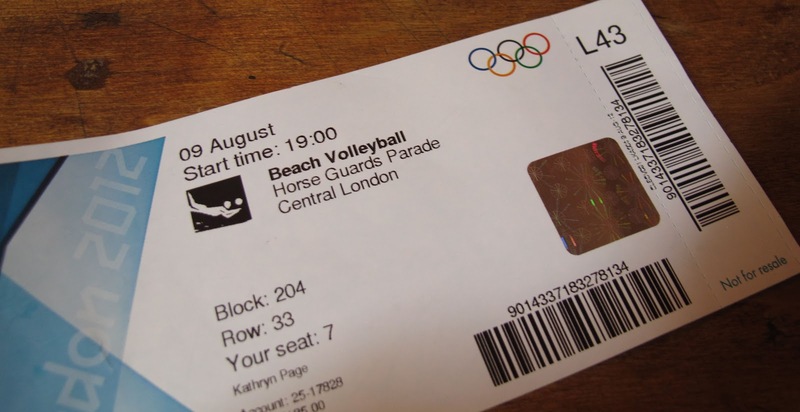 I can't say I was the first one to buy tickets to the Olympics. In fact, I was closer to the last one to buy tickets, shortly before the games began. I wasn't sure I was going to be back in Paris in time to get to London, but once I realized I was, I went online and bought a ticket to the men's beach volleyball bronze and gold medal match. OK, maybe it wasn't that easy, but it was easier than I thought for what I learned afterwards was the most sought after ticket of the entire Olympic games. Living in France ended up working in my favor by allowing me to buy a ticket from the international site, and local pool of tickets. When I went to use my US credit card, it told me I had to buy from a US website, and that site had similar tickets, but almost twice the price. Luckily I have a French credit card that I was able to use which got me a ticket from the international site with significant cost savings. With several friends living in London, I also had places to stay, and people to catch up with. I had already heard from them that the big panic of the crowds descending in the city and clogging the streets and public transportation never came to fruition. My Eurostar train to London was completely full, but once I got off, the stations were quiet, except for dozens of brightly colored vested volunteers scattered everywhere. These volunteers, or "game makers" as they were called, were in the streets, in the tube stations, and pretty much anywhere I was when I had a question, so I came to know them more as my fleet of personal assistants. I had 70,000 assistants in the city, which may have been more than even I needed, and with many of them looking a little bored, I felt the need to talk to as many as I could. Sure, I'd get direction confirmation, but then we'd chat about the games, my outfit, and where they were from as some of the cops were shipped in from other parts of the world. Everyone couldn't have been nicer, personally escorting me to ticket booths, checking screens and times with me. 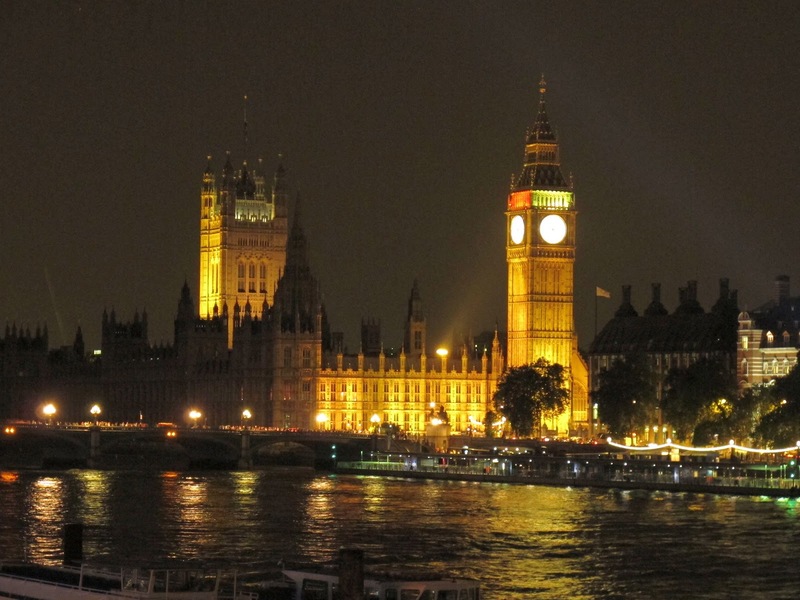 Yes, I felt like I had about 50 mini-dates while in London. In addition to all of the volunteers, everything was really well marked. There were special signs up directing you to each stadium. I was told these went up months in advance, and extended far out in the suburbs, so you'd always know where you were going, no matter where you were coming from, like Brussels. Beach volleyball was held in a new, temporary stadium erected in front of Buckingham Palace. 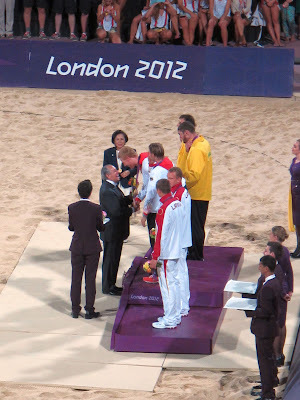 5,000 tons of sand was brought in from a quarry in the UK to create the playground for the athletes. Given the close proximity to Buckingham and their only in summer state room tour, I had a visit to the palace before the match. It's no Versailles, but was still quite nice, and I was able to see the unbelievable diamond collection from the Queen's Jubilee celebration. Getting into the stadium for the volleyball match, I had been instructed to treat it like an international flight, and arrive 2 hours early. You also couldn't bring in more than 3 ounces of liquid, except for sunscreen. I didn't get there quite that early, but there were no lines, and you did have to go through security. Again, everything went smoothly and quickly. Once inside the stadium grounds, the energy level was at a fever pitch. There was a matching band playing in front of quasi-creepy statues of Kerri Walsh and Emanuel Rego from Brazil. Maybe I was just jealous of the gigantic abs staring me in the face. There were places for food and drink, only open to ticket holders, but judging by the lines, I think they made enough money from these people alone. 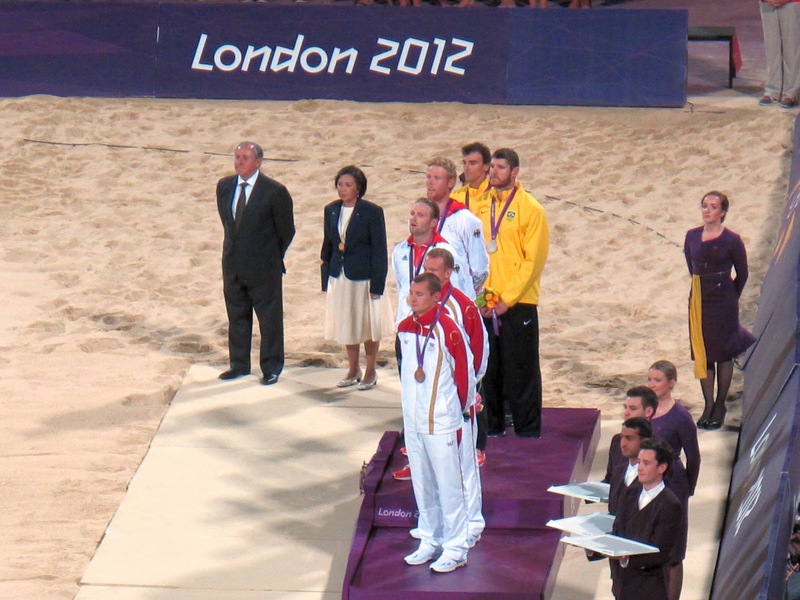 The venue held 15,000 people and was sold out, but I saw empty seats, especially for the bronze medal match. 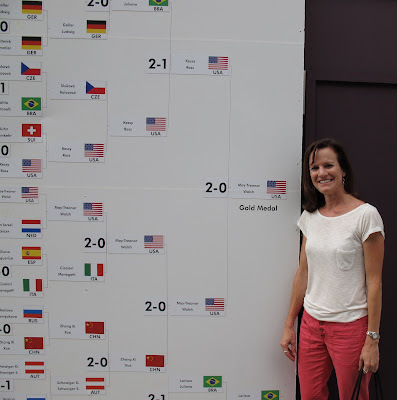 Sadly, neither US mens' beach volleyball team made it into the top 4, but I suppose I can't be greedy since both US women's teams played for gold, and I have had the opportunity to see both women's teams play in LA. 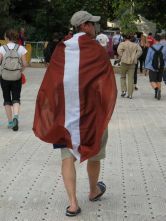 I cheered Latvia on to victory over the Netherlands in the bronze match, which went to an exciting 3 games. I did my best to cheer Brazil on, as did about half the stadium, but to no luck. The Germans beat them in the 3rd game. I found it fascinating that the stadium seemed to be exactly equally distributed with Germans and Brazilians. There was equal cheer between the countries with interesting outfits and songs sung. Some people got decked out in their country colors, and others preferred local masks. 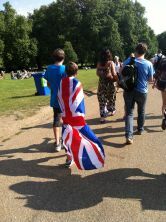 But the most popular Olympic accessory was wearing your country flag. The excitement in the stadium was palpable, but just to ensure everyone was getting their money's worth, there was lots of other action going on at all times. Upbeat music played between points, and there were even odd dancers coming out during long breaks. They even tried to turn raking the court into entertainment with somewhat lude talks on the rakers, their background and what they did with their rakes after hours, but somehow everyone eventually got excited for, "Rakey, rakey time!" I'm fairly convinced that I got as good of a workout as the athletes competing with the amount of time I was forced out of my seat to do another wave and shout, "ole!" I got chills during the medal awarding ceremony, even though I didn't have much of a connection to the winners. The cameras were let on the court first and they ran and dove for prime position. 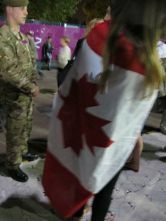 Then you hear the Chariots of Fire music and the entire crowd is on their feet cheering for their teams as they walk in and are awarded their medals. For people who didn't have tickets to events, they set up giant screens around the city where people could watch. The biggest viewing area was in Hyde Park where you had to go through security, but then there was a big festival like atmosphere with bands playing, in addition to the games playing in several areas. Some venues were also outside so free to the public to watch like the swimming. 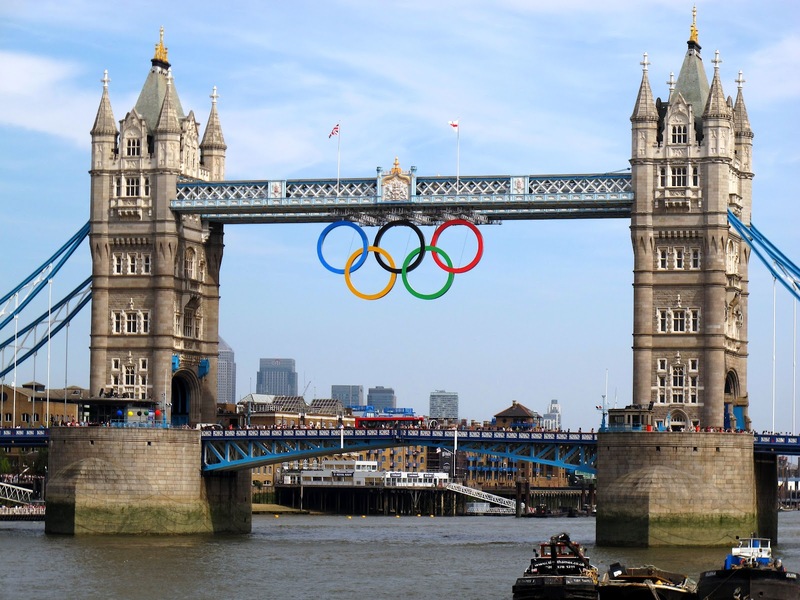 It was exciting to be at the Olympics, but also fun to just be in London, filled with great energy. And of course there was some great English eating from fish and chips to sticky toffee pudding, and more authentic Indian food than I'm finding in Paris. There was also inventive food like at the Soho tapas style restaurant, Barrafina. And then there was the inventive Kopapa in Covent Gardens that I'd recommend for a great meal with different delicacies with a New Zealand flair, and I'm not just talking about their local vodka, though I was a big fan of that too. And I can't leave out the best grilled cheese in the country, if not the world, served at the fabulous Borough Market. It was fun to be back in London after several years, made even better by the addition of the Olympics.